Mom came home from the hospital a couple of days ago and is doing really well. Turns out the information we got from the surgeon was wrong--she actually bled more than last time (but, you know, he's an ortho surgeon so as long as the bone bits are fine, as far as he's concerned, it went well :-P). But she is certainly not as sick and her blood pressure didn't drop, so she's recovering much better. Also, we didn't know how low her haemoglobin was last time, so we weren't treating it for a few months. This time, we've got her on the blood builder right away. They did a different approach than the last hip, too, so there are different restrictions than last time in what movements she can do and can't do for the next little while. There's more swelling too, but she seems to be in much better spirits than last time. I've been looking after her and also getting back into doing some graphics-like stuff. I miss my PaintShop Pro, which is Windows only and I'm on a Mac now. I tried the Photoshop CC trial, and OMG, it is soooo much easier to do anything on there than in the other programmes I've been trying. But it's also sooooo expensive. Why did they switch to a subscription service? That's impossible for an amateur to keep up with. Affinity Designer and Photo were recommended to me, and they are one time payments for a reasonable amount of money. Designer I really like. Super easy to use, with even better features in some areas than PS. But the Photo one isn't quite as good for what I want to do. It would be good for icons and stuff, but not so much for painting and drawing, and I haven't quite worked out if I can do what I want in Designer on that front. But we'll see. I have a few options I'm trying out before I make a decision to buy. 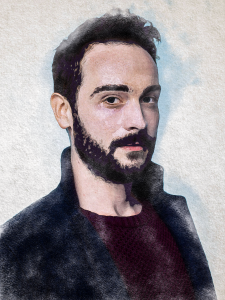 It was originally a picture of Tom Mison, which I first manipulated the colours on and then did a watercolour effect over. Learning skills is fun!